Hailing from New York, YAMA Founding Director Stephanie Hsu is quietly falling in love with the Yakima Valley, the beautiful northwest, and her work here. 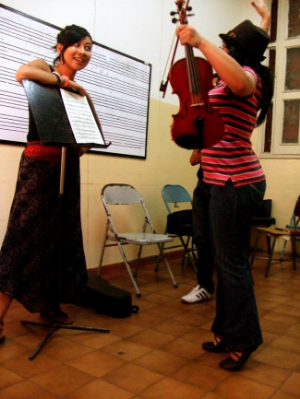 Her inspiration and training prior to creating the YAMA program came from her time at the New England Conservatory's Sistema Fellows Program, launched by Maestro Jose Antonio Abreu's TED Prize Wish, and her subsequent travels in Venezuela. Ms. Hsu received her B.A. with High Honors in Education, Sociology, and Anthropology from Swarthmore College and credits her work at CITYterm at the Masters School, Chinatown Youth Initiatives, and the Chester Children's Chorus with influencing her growth and path. During those moments in time when not involved in YAMA projects, Ms. Hsu can be found rehearsing and performing with her eclectic Latin music ensembleLa Cantina and in the viola section of the Yakima Symphony Orchestra, or hiking by summer / knitting by winter / wandering, wondering, and writing by fall and by spring. As a Founding Teaching Artist and Site Director at YAMA, Alex Pualani conducts, teaches all stringed instruments, arranges and composes music, develops curriculum and performs (and more) on any given day. Alex is a member of the Mid-Columbia Symphony Orchestra and frequently performs with various groups in and around the Yakima and Ellensburg areas. He also maintains a large studio of students of all ages and teacher Band and Orchestra at CTCS. Alex received his B.A. from Gonzaga University and his M.M. in Performance and Pedagogy from Central Washington University. His main teachers were Kevin Hekmatpanah, Minna Rose Chung and John Michel. He was also a student of Hans Jorgen Jensen of Northwestern and Julia Lichten of the Manhattan School of Music during his time at the Meadowmount School of Music. Alex lives in Selah, Washington with his wife, son, daughter and two dogs, Abby and Brahms. To learn more about Mr. Pualani, visit his website here. Jennifer Moultine, Cello Teaching Artist and Site Director for YAMA Philharmonia, YAMA's leadership program housed at Davis High School, lives in Ellensburg, WA. Taking a rather winding path away from and back to Central Washington, Jen has studied music, performed throughout the northwest, been a baker, lived in the jungle of Ecuador, managed a crisis hotline in Olympia, WA, studied public health and writing at the Evergreen State College, worked as a music librarian, and been a stay-at-home mom, among other things. Mrs. Moultine has been a member of the Yakima Symphony Orchestra since 1999 and joined YAMA as a Teaching Artist in January 2014. She also plays baroque cello, performing regularly with the faculty of Central Washington University and other early music performers in the University's Musica Antiqua Series and around the Pacific Northwest. Mrs. Moultine enjoys hiking and hanging out with her husband and two kids when she is not making music with her YAMA family.